PAULA CHAMPAGNEThe author draws stares (those tires!) and gets tips on how to fat bike in winter, deep in the Maine Woods. Fat bikes draw attention. Tricked out with bulbous tires measuring 3, 4, even 5 inches wide, they’re more dune buggy than mountain bike. And while those tires allow cyclists to roll over just about any terrain, they also elicit comments from bystanders. Which means I’m more than a little self-conscious as I adjust the seat on my rented Trek Farley (tire width: 4.5 inches) in the parking area of AMC’s Medawisla Lodge & Cabins in the Maine Woods. Bundled in winter layers and clunky snow boots, I see a decent chance of embarrassment on the 50 icy feet between me and the trailhead. “Those are the biggest tires ever!” one woman exclaims as she click-clacks past me in cross-country ski boots. Another skier walks over for a closer look and says he just tried fat biking for the first time last week. Seat set and helmet strapped on, I can’t delay any longer. I swing a leg over the bike, settle into the saddle, and start rolling. There’s truth in the cliché that you never forget how to ride a bike, but that glosses over the fact that every bike feels different. This fat bike isn’t nearly as nimble as my road bike. I won’t be carving any tight turns on this tank, but it does rumble across the icy lot without a hint of slipping. I pedal onto the trail and slowly pick up speed. A skier pauses to watch me pass. “Hey, that looks like fun!” she says. Yes. Yes, it is. One explanation for the explosive growth of fat tire biking is that these cartoonish wheeled rides fill a need for avid cyclists. I’ve heard more than a few riders refer to their “quiver” of bikes, as though they’re archers armed with an array of arrows, each weighted and feathered for specific conditions. A road bike for pavement, a mountain bike for trails, a single-speed for the city. Bikes for shopping, touring, gravel, and cruising. An obsessive cyclist could have a specific ride for every season, surface, and use. But until the first fat tire bike was cobbled together, there was no option designed specifically for snow or sand. Another explanation for fat bikes’ popularity? They’re just plain fun to ride on any surface. I own two thin-tired bikes: a road bike and a commuting bike. At the first big snowfall, they go onto a rack on the porch and hang, ignored, for months. So when I had the opportunity to spend a February weekend riding through the Maine Woods, I pulled my cycling tights from the back of a dresser drawer, packed my bags, and called Erik daSilva, the education program coordinator for the Bicycle Coalition of Maine. AMC’s Maine Woods office had been talking with daSilva about doing some bike education and safety programs for lodge staff, and my visit was the perfect excuse for him to drive up from his home in Orono, Maine, for a day of winter riding. DaSilva’s quiver holds nine bikes, including a retro three-speed, a recumbent, and a tandem. When he travels by bus, daSilva often stows a bike in the luggage compartment so he can pedal to his final destination from the terminal. “One of my beliefs is that any opportunity we are given to get out of the car and onto a bike, I will seize,” he says on the phone. For him, biking isn’t just a day job. Although daSilva has been biking his entire life, his fat bike quickly unseated his other rides after he bought it five years ago. “It has been not only my most reliable bike but also the bike I’ve gotten the most bang for my buck with,” he says. He uses it to ferry camping gear through remote forest for days at a time; he cruises around his local mountain bike trails; and, of course, he rides it all winter. He describes a recent route that traversed multiple parks and neighborhoods, passing friends’ houses along the way. The picture in my head isn’t of grownups on a long-distance ride but the pack of kids in Stranger Things, tearing around their small town, relishing their bike-given independence. AMC’s Maine Woods land—75,000 acres, three lodges, 140 miles of trail, all within the state’s 100-Mile Wilderness conservation corridor—has been a prime hiking, paddling, fly-fishing, and cross-country ski destination for more than a decade. But cyclists discovered the joys of the area more recently, when AMC opened 80 miles of single-track mountain bike trails on Trout Mountain, about 3 miles southeast of its newest lodge, Medawisla. Add that to AMC’s 90-odd miles of groomed ski trails, and it makes for one of the largest networks in Maine open to winter cycling. Some journey here for a day of riding. Others book a stay and pedal lodge-to-lodge. From Medawisla, cyclists and skiers alike can thread between a row of cabins to Lakeside Trail. From there, it’s choose your own adventure. Go left to explore the frozen expanse of Second Roach Pond. Stay straight to wind along the pond’s southern shore. Or turn right and head into the hills and mountains, beyond which you can access AMC’s other lodges, Little Lyford and Gorman Chairback. When daSilva arrives at Medawisla the next morning, we take a quick look at the map and choose the third option. We head east, away from the lodge and between the cabins. It’s an odd sensation, riding a fat bike. The big tires, barely inflated at all, bounce gently as I pedal, smoothing out the bumps in the trail. The softer the snow, the lower the desirable air pressure, so I’m riding on about 5 pounds per square inch (psi). By comparison, I pump my road bike tires up to 120 psi and can feel every pebble and crack in the pavement. DaSilva and I ride side by side, chatting about our biking backgrounds. It’s easy going at first, with the trail rising and falling gently. Then we reach our turn onto Shaw Mountain Cutoff and take a right into the hills. The trail begins to rise. Soon I begin to feel a dull, unsettling burn in my quads. This ride is about to get tough. I stop to catch my breath, and daSilva kindly lets a little air out of my tires so they don’t sink as far into the snow. We pedal on, daSilva doing most of the talking now. He tells me about his road racing days, when he knocked his front teeth out in a crash. The fast-paced frenzy of road cycling seems like a distant relative to our current activity. I’m pedaling furiously yet moving about 5 miles per hour. Back at the lodge, Shaw Mountain had looked like a fingerprint on the map, with topographical whorls tightly clustered around the summit’s twin peaks (2,499 and 2,641 feet). We turn left at the next fork, and Skyline Trail begins traversing the mountain’s northern shoulder. I have to stop to catch my breath again. Regaining my momentum is no breeze, though. I pump the pedals furiously and wobble forward like a little kid on a two-wheeler, venturing away from a parent’s stabilizing hand for the first time. The pattern repeats again and again. DaSilva is now a dark dot in the distance. Eventually I give up and walk the bike up the steepest sections. I take consolation in the thought that it’s like backcountry skiing: I’m just earning my turns. That 600 feet of elevation gain over the last mile? All of this work will pay off when I get to fly back down. But first we want to touch the summit. DaSilva waits for me to catch up and urges me back into the saddle. After 4 miles of riding, we ditch our bikes and hike the last quarter-mile to the summit. Then it’s time to descend. DaSilva takes the more direct route, shooting down a narrow strip of single-track. I double back on the wider ski trail we’d just climbed and enjoy the wind in my face as I pick up speed. I hear a shout carry through the trees—“WOOOO-HOOOOOO!”—followed by screeching brakes. I’m glad I’ve left the technical riding to daSilva. I grip my handlebars and rumble down the trail, tapping the brakes to fishtail into each turn. It’s effortless and exhilarating. With his enthusiasm and the rush of my own descent, the thigh-burning climb is forgotten. Adrenaline pumping, we head back to the lodge for a hot meal. Cyclists and skiers sharing trails would’ve seemed absurd not that long ago. It wasn’t until the 1980s that some enterprising bikers retrofitted their rides for snowy and sandy conditions. Just as the first snowboard was made by fastening two skis together, these tinkerers welded traditional wheels to double wheel width. By tweaking the familiar, they created a new version of the sport. Fat biking emerged from the do-it-yourself crowd to find a mainstream audience about a decade ago. In 2005 Surly, a Minnesota-based manufacturer, introduced the first consumer fat bike, the bright purple Pugsley. Sales exploded within a few years. Quality Bicycle Parts, which owns Surly and another manufacturer, Salsa, saw 187 percent growth in 2010 followed by 246 percent growth in 2011. Major manufacturers, such as Trek and Specialized, began making their own models and, according to Bicycle Retailer and Industry News, fat bike sales leapt 44 percent in a single year, to nearly 37,000 bikes, in 2014. Sales have since leveled off, but with tens of thousands of fat bikes now in use, they’re no longer quite so novel. Cyclists ride them year-round, on all terrain—not only on sand and snow but also on traditional mountain bike trails and on roads in bad weather. You can buy one at Wal-Mart for $219 or drop $7,000 on a top-of-the-line Specialized made almost entirely from carbon. Back in the warmth of the lodge, I slurp down two bowls of tomato soup and chase that with enough grilled cheese sandwiches to lose count. I’m totally exhausted. But the trails beckon, and soon we’re hopping back into the saddle. This time we turn left off Lakeside Trail and head toward Second Roach Pond. DaSilva pops a wheelie and tries pedaling on one tire. When he loses his balance and flips onto his back, he howls with laughter, still pedaling the bike he’s now holding in the air above him. Soon we shoot down a hill and onto the frozen pond, where a groomer has laid a path to the opposite shore. DaSilva spots a cluster of boulders emerging from the ice and accelerates. He pedals toward the closest rock and, using it as a ramp, launches into the air. He swerves to jump off the next and the next until he’s tried them all. When we finally set out for the northern shore, we ignore the path entirely, weaving between wind-bared ice patches and blasting through snow drifts. We ride parallel to a peninsula until daSilva spots an opening. He plows through a snowbank and onto a thread of packed single-track leading into the trees. Once off the wide-open ice, we have to focus on riding a straight line. Deep powder threatens to devour us like quicksand if we veer a few inches right or left. We duck under low-hanging branches, downshift into easier gears, and roll over rocks and roots poking out of the snow. This is it. This is the joy of fat biking. Cruising across the ice then rolling up into the forest. It’s the bike of my childhood dreams: a two-wheeled monster truck that can roll over almost anything in its path. Just think twice before you try to climb a mountain. Snowy conditions vary greatly, depending on temperature and grooming, and you may need to adjust on the fly. Be careful when approaching the high and low ends of Meyer’s scale, though. The lower your pressure, the greater risk of damaging the rims if you hit something hard. At the other end of the range, higher pressure in those large tires puts tremendous force on the rims, which can cause damage. Leave no tread! Learn how to fat bike responsibly. Get tips on choosing the right model for you from our gear guru. Reserve a cabin or a bunk at Medawisla. Not into cycling? Pick another Medawisla activity from our peak-season guide. 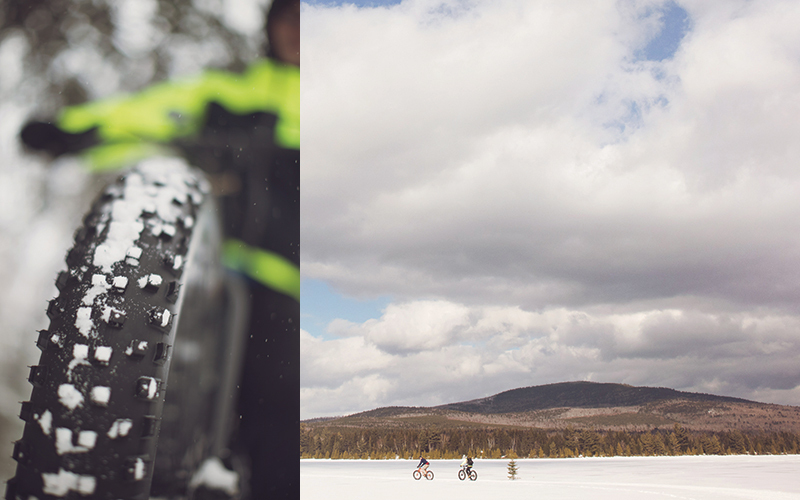 Find seven more Northeastern destinations for winter fat biking.